Welcome to the Rotary Club of Montgomery Village! 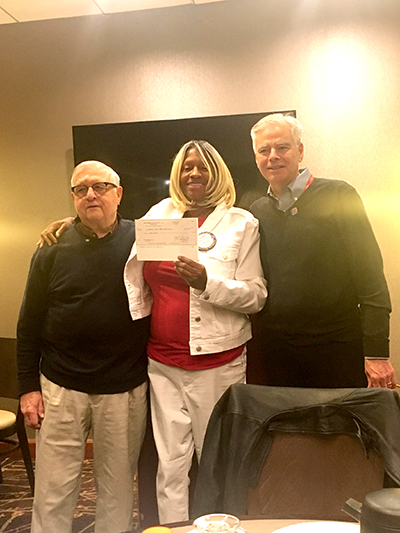 Montgomery Village Rotary Club presents Judith Clark, a longtime member of our club, a donation of $2,000 towards her organization, Women Who Care Ministries. She gave an outstanding presentation and was then awarded the check. 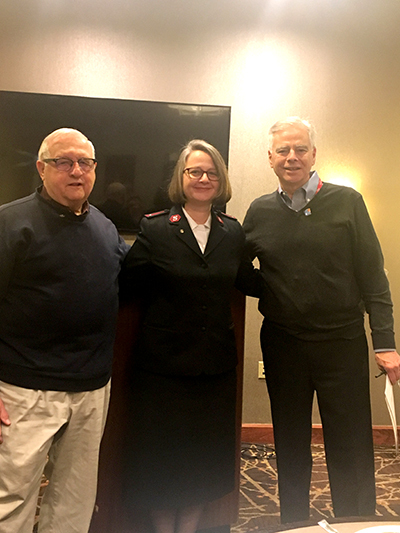 Congratulations to Lt. Carmen Owens of The Salvation Army for becoming the newest member of the Montgomery Village Rotary Club. After she was officially inducted into our club she was provided a donation of $1,000 towards the Salvation Army. Welcome to the Rotary Club of Montgomery Village website. You may be asking "What is the Rotary Club of Montgomery Village? ", "Who Joins a Rotary Club" and "What is the purpose of a Rotary Club?" If you are visiting this page, you may be asking yourself - Why Join Rotary? Every member finds a personal reason to join, but here are 20 reasons why you may want to join. How does someone become a Member of Rotary? Rotary is always looking for qualified buisness and professional leaders who are interested in, and committed to, advancing the mission of Rotary. Members present candidate names to the Board for consideration and then, if the Board accepts the member's recommendation, an invitation is offered to the candidate. To learn more about the Objects of Rotary, and the commitment of time and finances associated with membership, contact a member today. An application form and a copy of the RI pamphlet "How To Propose a New Member" is located in the Club Documents Section.